The Twelve Days of Christmas are past; it is Epiphany. Today — the day we commemorate the Wise Men’s visit to Baby Jesus — is our official farewell to the Christmas season. But can I linger on the Christmas story just a little bit longer? Because I’m not quite ready to say goodbye. I’m amazed by the sheer number of times Heaven enters our world in the events leading up to and surrounding the birth of Christ. First the angel Gabriel, who stands in the very presence of God, appears to Zechariah, foretelling the birth of a son – a prophet — to a barren woman. Then Gabriel appears to Mary with a message unlike any other, announcing a calling unlike any other: she will give birth to the Son of the Most High. She has been chosen to mother the Messiah, to carry the One whose Kingdom will never end. Of one thing this young Virgin is certain: the God we serve is the God of the Impossible. And when Mary arrives at Elizabeth’s home and the Holy Spirit fills Elizabeth, causing her to prophesy over Mary, oh, it just takes my breath away. For here in this moment, God trusts not an angel but a fallen human being to deliver confirmation that Mary isn’t crazy, that she isn’t alone, and that the Child within her truly is special. Joseph is visited in a dream that both confirms the Virgin Birth and ensures that the Babe’s birthplace will be in Bethlehem, just as the Scriptures promise. I’m not one to put too much stock in our night dreams, so I’m thankful Mary’s husband takes heed of his. And then there were the shepherds, night-shift-workers minding their own business. Non-essential players all – until they hear the host of Heaven, that is. Nudged onto the stage of the Nativity, they travel to the city of David, where their arrival on the stable’s doorstep confirms to Mary and Joseph yet again the specialness of this Child. Joseph and Mary, good Jewish parents that they are, dedicate their son at the Temple. And God confirms His word once more, this time through a praying woman and a dying man. The identity of God’s Son is revealed to Simeon and Anna, bolstering both the freshly-minted parents and the elderly faithfuls: this is the beauty of the gift of prophecy. I’m overwhelmed by the lengths God went to in order to confirm His Word and the coming of His Son. Over and over again, He speaks. Mary certainly had many things to treasure in her heart, to remind herself that she was indeed NOT crazy. But the part about the Christmas story I cherish so very much is what we celebrate today – God’s inclusion of pagans in His redemption story. These pagans, these Wise Men from the East, were not of the family of Israel. These Magi, these star-gazers, placed their trust in the sky. But God speaks their language: He gives them a sign in their beloved sky. And when their faith leads them to seek and find the Promised Child, they worship Him. God rewards their sacrifices with another sign, this time a dream to send them safely on their way back home. I absolutely love this about God, that He invites ALL people to be part of His story, to be part of His family, to receive His salvation. Epiphany means “to make manifest.” And today, we rejoice in this Epiphany. We rejoice that God makes Himself known not only to Israelites but also to Gentiles like the Wise Men — to a Gentile like myself. We rejoice that from the very beginning, God wanted communion with every single person He created – and that when He made Himself manifest to Abraham, it was to bless all families on earth. His covenant was not only meant to set Abraham apart, it was meant to draw all people to Him. So on this day, we honor the heart of the Father, a heart that beats with longing for us. This world He made, we broke it. He unbreaks it, through a tiny Baby. 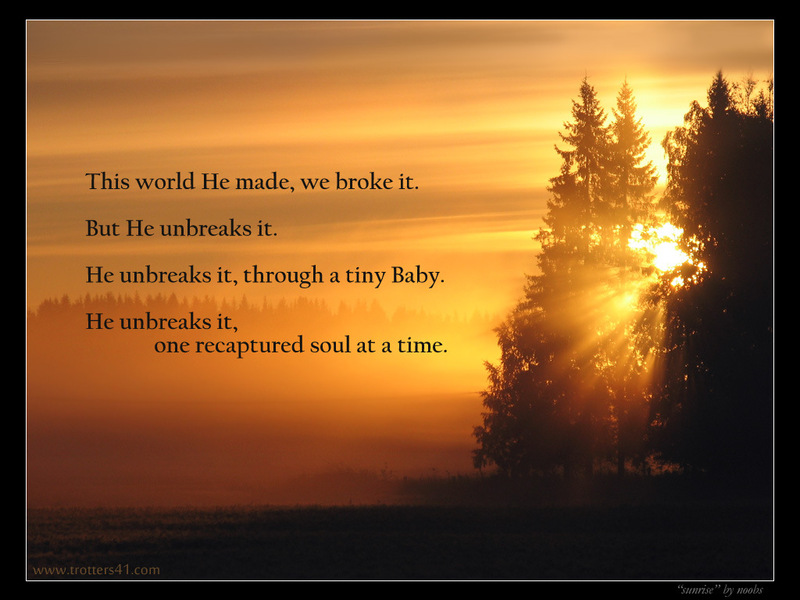 He unbreaks it, one recaptured soul at a time. All people may come — praying saints, dirty shepherds, unexpected pagans from afar. His will is for all to hear His voice, to see His star. His will is for all to turn toward Him, to journey to Him. His desire is for the nations. ← What Good is That? ?